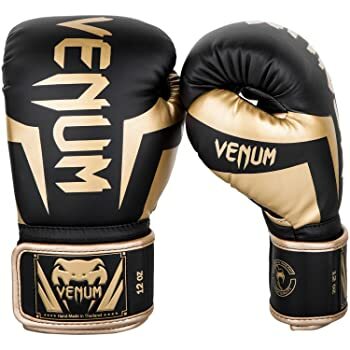 The Venum Elite Boxing Gloves are a sturdy pair made to suit both the advanced and beginner boxers and are ideal for mitt work, fitness boxing, and bag work. With skintex leather outer part and triple density foam layers, they are great protection from strain and injuries for any fighters. This well priced pair of gloves has seams that are reinforced together with mesh panels that aid in thermal regulation. Further, the ergonomically shaped glove ensures a perfect fit as well as a comfortable feel. The pair also comes with long cuffs that improve the user’s wrist protection and the wide elastic Velcro wrist strap ensures hands stay straight even in the midst of very heavy impacts. 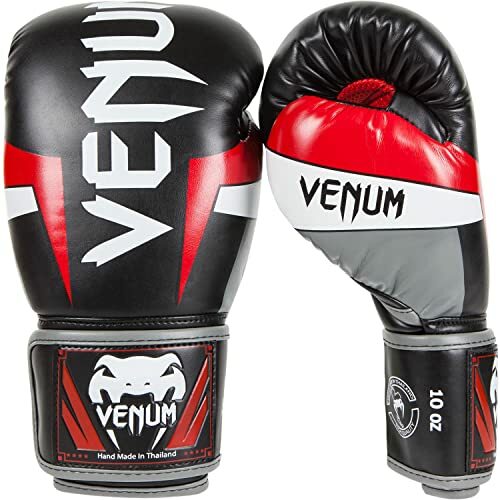 The Venum Elite Boxing Gloves are handcrafted with skintex leather. This feature provides durability, comfort and a sleek look that can be described as flashy yet fierce. The gloves are available with 8 different colors to match your style. The mesh panel ensures the hands remain cool while using the gloves despite the duration or number of punches thrown. A comfortable feeling is achieved since the hands remain dry as a result of the regulation of heat through this mesh panel. The triple density foam ensures most of the shock received is absorbed efficiently. Thus any high impact can be absorbed easily and even lessen the stress received by the gloves themselves which enhances their durability. The balanced shock distribution can have an overall positive effect on the user too, by improving their skills since no stress is transferred or felt on the arms with each impact. The Venum Elite seem to have less or no cons about them except for the dislike of the skintex leather used by a few users. They may be rejected from more professional boxing despite the amazing features but still remain ideal for the casual enthusiast. The user can slip the hand easily into the glove after using a hand wrap and and hence fastens the elastic Velcro wrist wrap. The right size if picked will provide a perfect fit due to the ergonomically shape of the glove. The wrist wrap should be tightened to ensure the hand remains straight even on experiencing high impact levels. Boxing gloves should be worn with clean hand wraps to maintain cleanliness as well as absorb sweat from the palms. Although the Venum Elite gloves have a mesh panel that helps in regulating heat, the hand wraps are still recommended. Cleaning of boxing gloves should involve some salty water whose function is to rid the wear of any germs that may result from sweat which is usually inevitable. A thorough cleaning should be followed with a complete dry out to ensure no dampness remains inside the gloves to keep away germs that breed very fast in moist areas as well as maintain quality and ensure durability. 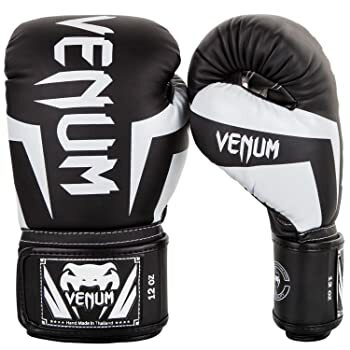 Venum Elite Boxing Gloves are durable, comfortable while covering all the basics and shouldn’t be missed as part of one’s boxing gear. Any professional or enthusiastic boxer should know that the most important part of their gear that can be brought into a ring is the right boxing gloves, since they need to be protected from strain and injuries while sparring.